1765 Richard White (Councillor White) purchases Bantry House (then called Blackrock House). 1767 Birth of Richard White (First Earl of Bantry). 1796 Attempted invasion of Ireland by the French, led by Wolfe Tone. 1797 Richard White created Baron Bantry. 1800 Birth of Richard White (Second Earl of Bantry). 1801 The title of Baron Bantry is advanced to Viscount Berehaven. 1801 Birth of William White (Third Earl of Bantry). 1816 Richard White elevated to the peerage (1st Earl of Bantry). 1820 to 1840 Richard White, Viscount Berehaven travels extensively and creates his collection. 1840 to 1860 The Famine. Major works on the demesne in progress. 1922 Irish Civil War. Bantry House used as a hospital for 5 years. 1939 to 1945 Second World War. During the war years, the house and stables were occupied by the Second Cyclist Squadron of the Irish Army. 1946 House opens to the public. 1956 Sale of eight important paintings by F. and G. Guardi. Two of which, “Erminia and the Shepherds” and “Carlo and Ubaldo Resisting the Enchantments of Armida’s Nymphs”, are now at the National Gallery in Washington D.C., U.S.A.
1978 Egerton Shelswell-White inherits the house. 2001 Archaeological findings (conducted by University of Ulster) of a medieval Gaelic village and a 17th century deserted English fishing settlement on the west lawn. 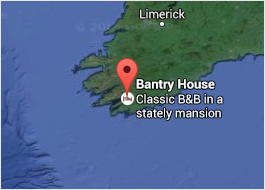 For a more in depth history of Bantry House click here. A piece written by Geoffrey Shelswell-White in 1951 can be downloaded here. A book about the history of Bantry House and the Shelswell-White family can be purchased through our online shop or at the house. Group bookings welcome - special rates available.